My ancestor George Boddy (c1761-1834) was a shipwright and Timber Master in the Royal Navy Dockyards for 57 years. I have traced his long career using various resources, but one of the most helpful has been Google Book Search. When I heard about this new search function last year, I tried the names of various ancestors – I thought that maybe one would appear in a book published in 1850, or some such. So I discovered the work of a naval dockyards historian called Roger Morriss, including the precise references to George Boddy in Admiralty and Navy Board papers at The National Archives, Kew and the National Maritime Museum, Greenwich. Who knows if I would have ever identified these papers for myself – but Roger Morriss’s work found via Google Book Search gave me a very welcome short cut. This July I visited The National Archives, Kew, and read, photographed and transcribed the letters from & about my ancestor – a real thrill for me and my mum who was visiting the Kew archives for the first time. I now know, in George’s own words, about his career moves from dockyard to dockyard, his invention of a tool to remove broken pintles (don’t ask, but he was hoping for money from the Admiralty! ), and about struggling to provide for his eight children. 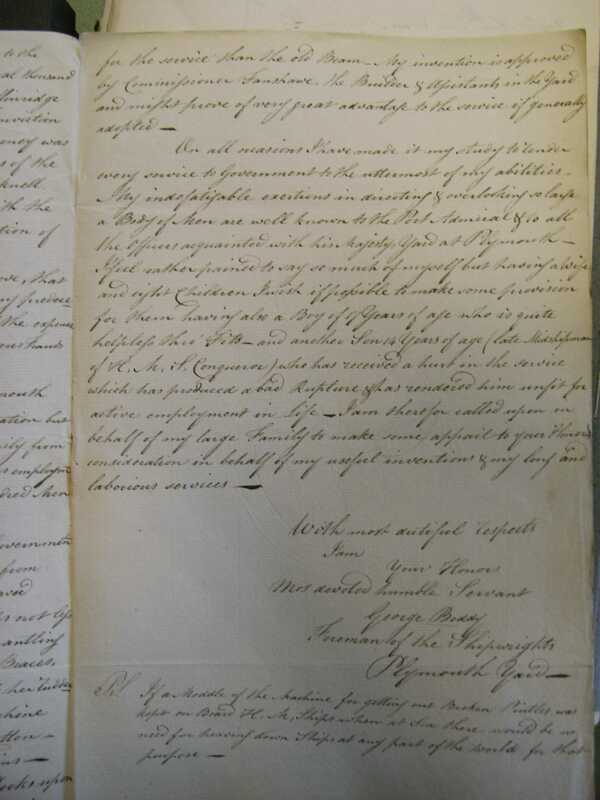 ADM1/4379 letter Pro B300 Page 3 letter from George Boddy to Sir Evan Nepean July 1805 This image is Crown copyright. ADM106/2227 a book of copy letters from the Navy Board to the Admiralty; page 385.